Sweden has a rugged natural landscpe with forests and lakes (around 90,000 of them) plus skiing in the winter. 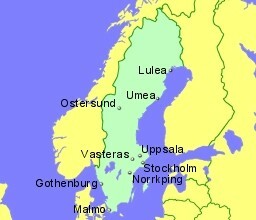 Sweden has some of the largest areas of unspoilt natural land in Europe. The northern half of the country is mountainous with vast forests, extending beyuond the arctic circle, while the southern half has agricultural areas, the major cities, and most of the lakes. Sweden is a member of the European Union and the currency is the Swedish Krona (SEK). Sweden is also a Schengen country. Located 14Km North West of Gothenburg, south west Sweden, giving the quickest access to the second largest city in Sweden. Located 11Km West of the city of Ostersund, beside lake Storsj?n and a ski destination, central Sweden. Located 42Km North of Stockholm, south east Sweden - this is the main airport for Swedens capital city.